SustainableWork: Iowa County Wisconsin. Entrepreneurship focus generates 60 new jobs developed, and 28 new jobs attracted. Many valuable startups launched. New businesses downtown. Entrepreneurship at work in economic development. Iowa County Wisconsin. Entrepreneurship focus generates 60 new jobs developed, and 28 new jobs attracted. Many valuable startups launched. New businesses downtown. Entrepreneurship at work in economic development. When I applied for the job of starting up an economic development program in rural Wisconsin I was as green as could be in this world. My first day on the job, the Great Recession was declared and the Dow dropped about 700 points. There was economic carnage everywhere. Our brand new Iowa County Area Economic Development Corporation (ICAEDC) set out to find new opportunities in this difficult environment and we did it. What worked was our focus on entrepreneurship and helping existing businesses grow. A new report I'm now circulating to our ICAEDC Board identifies at least 60 new jobs our group is being credited with helping develop. We are also credited with supporting the development of Barneveld's amazing new business park which has just attracted a planned 28 good new jobs to Iowa County. Photo is from the groundbreaking last week of Bio-Vet's new facility in the new Barneveld Business Park. Bio-Vet is a globally relevant, life sciences research and technology company we are thrilled to welcome to Iowa County. "Rick Terrien and the Iowa County EDC have been a valuable resource in helping the Village of Barneveld develop our new Business Park. As Village President, I often called Rick for continuing updates and information about economic development news and opportunities. This was a great value to me and the Village of Barneveld." Thank you Mike, and thank you Barneveld. My focus has always been entrepreneurship. Barneveld is so strategically located it jumps off the page with possibilities for entrepreneurs to grow. I think economic development emerges from strategies and actions that make the whole place increasingly entrepreneurial. Everyone should have opportunities. Among those 88 jobs developed and attracted, we're counting 32 new jobs for people with disabilities, now working at the amazing Wisconsin Innovation Kitchen. We've helped great new local businesses open in our downtowns. We've helped our existing local businesses grow. We've nurtured many new startups and helped launch some of the coolest new rural economic development stories in the country. I'm very proud of these results. Other Iowa County Area Economic Development success stories circulating on the news feed at our home page. 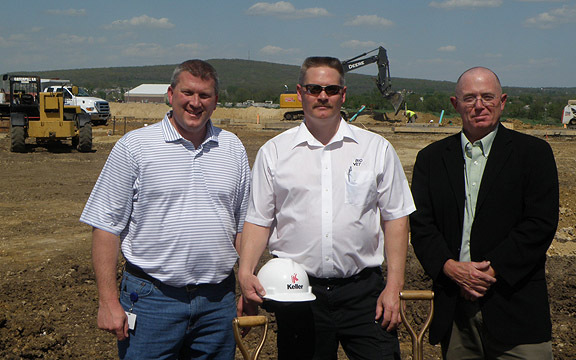 Pictured in photo (l to r) is Scott Leahy, Barneveld Village President, Bill Zimmer President of Bio-Vet, and Rick Terrien. Photo credit for this shot goes to former Village of Barneveld President Mike Peterson. Thanks Mike. Beautiful Blue Mound State Park is in the background. One of 3 wonderful state parks in Iowa County, WI.